Disruption has been a major topic of interest across multiple industries in recent years, with companies like Uber, SpaceX and AirBNB revolutionizing long-standing, traditional industries. Not surprisingly, in business, the company responsible for the disruption can reap huge rewards – and communication plays a major role in that. Whether it’s listening to and interacting with customers, or ensuring that every employee is united on the same goals, effective communication is critical to ensuring disruptive success. How Does Communication Lead to Industry Disruption? Communication is at the heart of industry disruption. When a company wants to change something, it must first listen to consumers and identify the changes they want or need. No company needs or wants to mess up something that already works. However, if a startup can make a product, process, or the customer experience better, enacting these changes is the ultimate way to cause positive disruption. Rapid communication – often through social media, Artificial Intelligence or chat programs – can help disruptors learn from customers in near-real time, improve their processes and iterate on the fly. How can a company cause disruption? It starts with pinpointing the weaknesses of their competitors, and creating innovative products or services. For example, big companies are often very slow to adapt to the latest technologies. Startups, on the other hand, typically excel in rapidly scaling the latest technological advancements to meet consumer needs. Miscommunication is also common among big companies. When a company has a thousand or more employees, it can be extremely challenging to ensure that they all stay on the same page. Small startups, however, often communicate well and can be better at building close relationships with their clients. In fact, for many startups that have disrupted certain markets, communication and co-innovation serve as the primary differentiator. Also, according to Ademola Adekunbi with Entrepreneur, advanced managerial practices of today’s advanced technology is crucial to industry disruption. The laundry industry is a good example. After all, washing machines have been around for decades. Established laundromats probably don’t think much about the ways today’s technology can improve the industry. Other than investing in energy-efficient washers and dryers that speed up the washing and drying process, there’s not much room for growth, right? Wrong. Imagine listening to the needs of laundry customers and using their pain points to create a laundromat that exceeds their expectations. This dream becomes a reality when enhanced communication abilities are present. Communicating with the customers allows a startup to understand their needs, and then it becomes possible to communicate their needs to the startup’s employees. For instance, this approach could lead to the creation of a laundromat that allows customers to log into an app and see if there are any open dryers and washers. They can then pay via the mobile app and reserve the units before they arrive. This setup is extremely convenient for consumers because they no longer have to fret about having correct change, or wasting time looking for an open machine. Communication for disruption is a two-step process. A startup must first listen to its customers and then communicate their needs with its employees. Below are steps that can be taken to enhance communication and disrupt an industry. Companies should start by communicating better with customers, which requires listening actively. Don’t focus too much on forming a response while the customer is speaking. Instead, actively listen to them. Regardless of size, companies looking to be disruptive must make sure they are understanding the customer correctly before they can determine and communicate a solution. Finally, be open to ideas from customers and adapt to their needs. Companies might think customers don’t understand the intricacies of the industry, but in reality, they may understand better than anyone. Putting yourself in the customer’s shoes is vital to communicating effectively with them. Think about the various ways that they prefer to communicate. Are they extremely busy and less formal? Or, do they prefer longer, face-to-face or more personal communications? In each case, the ideal communications vehicle would differ. When a company wants to disrupt an industry, a team effort must be made. Leaders can’t expect their employees to understand what the company’s goals are unless they have been clearly communicated. Clear, concise visuals can often be extremely valuable. For example, communicators can use charts and graphs to demonstrate how they plan to achieve their goals. Meetings can seem tedious, but they are at the core of enhanced communication. For leaders, they ensure that all communication is clear and can be effectively passed down to lower-level employees. However, these meetings must be focused, action-oriented and contain clear goals. In addition to meetings, brainstorming sessions are a time when everyone can lay their ideas on the table. Even if an idea doesn’t sound promising at first, don’t dismiss it out of hand. Once everyone throws in their opinions and knowledge on a certain topic, leaders may find that that idea propels their businesses to the next level of success. Always use the latest tools for technology. In today’s technologically-advanced society, there are more ways than ever before to communicate with employees and customers. Leaders must harness the latest tools to ensure they are meeting the needs of their customers as well as their employees. From video conferencing to email to instant messaging, companies should leverage multiple tools to improve communication. Sparking innovation, another key element to industry disruption, starts with listening. Employees’ voices matter just as much as the customers’. In the past, it could take a long time for an idea to reach executives who had the power to give approval. Today’s communication tools make it easy to share innovative ideas instantly. Don’t be afraid to iterate on a trial-and-error basis. Leaders can’t hold back from trying different things and thinking outside of the box if they want to create a product or service that revolutionizes what’s already available. According to Alex Goryachev with Forbes, discussing failures is key to industry disruption. Through effective communication and co-innovation, a startup can create products and services that truly delight customers. 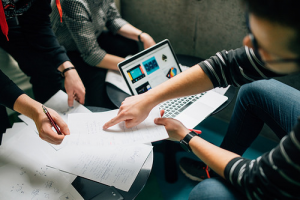 Earning a Master of Communication Management online from the University of Southern California can help today’s leaders understand how disruption, co-innovation and communication go hand in hand.